Mochitsuki (もちつき) is one of Ashley's microgames in the Japanese version of WarioWare: D.I.Y. In localized versions, it was changed to the microgame, Ketchup Down. The object of the game is to make a rice cake (mochi). 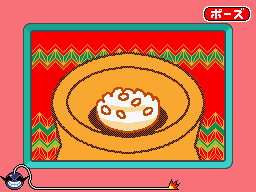 To do so, the player must quickly tap the rice in order to beat it into a pulp. Once the rice is sufficiently mashed up, the game is won. However, if the time ends and the cake is unfinished, the game ends in a loss.